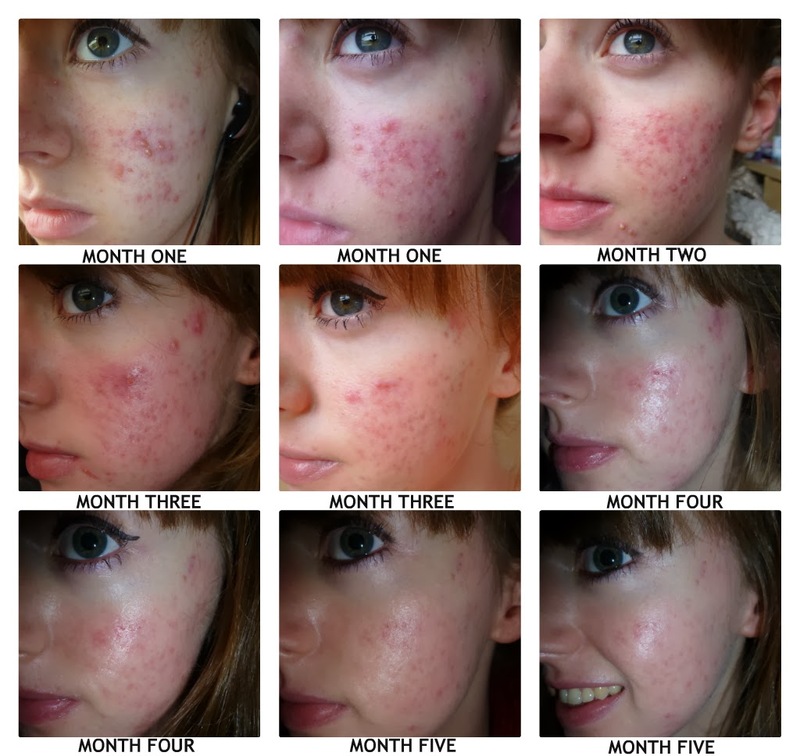 Life On Roaccutane | Final Months & Overview! It's all over and I'm more than ecstatic with the results of my treatment. My dermatologist kept me on 50mg a day for the remainder of my treatment. During my first month, I was on 30mg a day, but I was increased to 50mg and that stayed constant every month after. In total, I've taken 455 tablets over the past 5 months...how crazy is that?! Below are photos of my skin progress in the middle of month four. Things were starting to clear up really nicely. My skin looked quite inflamed, but at this stage, my skin was smooth and there were no active breakouts (yippee!). As far as side-effects, I was still experiencing dry skin, but it was manageable as I'd keep applying loads of moisturiser when I was around the house. I did get the flu during month four and it was actually the first time I had been properly ill on Roaccutane; since I got occasional headaches on the drug, being ill brought on really bad migraines (which I had never experienced before). Some paracetamol with loads of water made sure they didn't come back when I recovered from the flu. Below are photos of my progress at the beginning of month five. At this stage, my skin was clearing more and more every day! I woke up in the morning looking forward to seeing the progress in my skin, which is a huge transformation as before/at the beginning of Roaccutane I'd avoid mirrors at all costs. I felt like my confidence was finally coming back too; I started University last month and I found myself being more sociable, as before, I'd hide in the corner to hide my acne-ridden face from the world. I came across no new side-effects towards the end of my treatment; dry skin, dry lips, back aches and dry eyes were the side-effects that affected me most. And finally, my end of treatment photos (below)! I'm so pleased with the results, it's been a long, tearful and stressful road to clear skin, but 100% worth it. Roaccutane has made my skin so smooth and acne-sufferers will relate to me when I say this- but it feels so nice to wash my face without the fear of irritating break outs and actually washing smooth skin! I still have a few pot hole scars and lots of hyperpigmentation, but my dermatologist said as Roaccutane makes your face redder and more inflamed as usual, the marks should be less noticeable once the medication starts to leave my system. My skincare routine changed considerably towards the end of my treatment. I substituted my old Cetaphil face wash with Simple Moisturising face wash. Personally, I think the Simple face wash is as moisturising as Cetaphil's wash, but it is foaming, which I like better when washing my face (and it's a lot cheaper, too!). I've fallen in love with Eucerin's DermoPURIFYER Adjunctive Hydrating Care cream. Eucerin have brought out a new range which is targeted towards skin types that are being treated with acne medication. I use this in the morning as a make-up base as it is so moisturising and doesn't make my make-up flake. It is quite a heavy base for make-up, but my skin really needed it on Roaccutane. I continued to use Aveeno cream when around the house and before bedtime as well as Hypromellose eye drops every morning and night for my dry eyes. I'm incredibly happy with my skin care routine at the moment, and I think I'll continue to use this routine although I'm not on the medication anymore. So, that's it! 5 months. 22 weeks. 163 days. 455 tablets. The past five months have been the hardest and the best five months of my life. At the beginning of the Summer, I left school and spent hours before my Leavers' Prom getting upset and obsessing over how awful my skin would look in photographs. I went on amazing holidays during the summer. My skin finally started to clear and I started University in September feeling more confident than I had ever been. People don't know what it's like having acne until they've experienced it themselves, and it completely destroyed my self-confidence and stopped me from being as social as I used to be. However, going on Roaccutane has been one of the best decisions I've made and I'm delighted to say I was very successful with the medication. If you're suffering from acne or anything that is destroying your self-confidence at the moment, stay strong, and tell yourself things will get better. Because they will, I promise. If you'd like me to write a post-roaccutane blog, let me know. And feel free to comment on this post or email me at alixstaines.blog@gmail.com and I'll do my best to answer any of your questions. What have been your experiences with Roaccutane? Have you used it yourself? Or have any friends/family been on the medication?